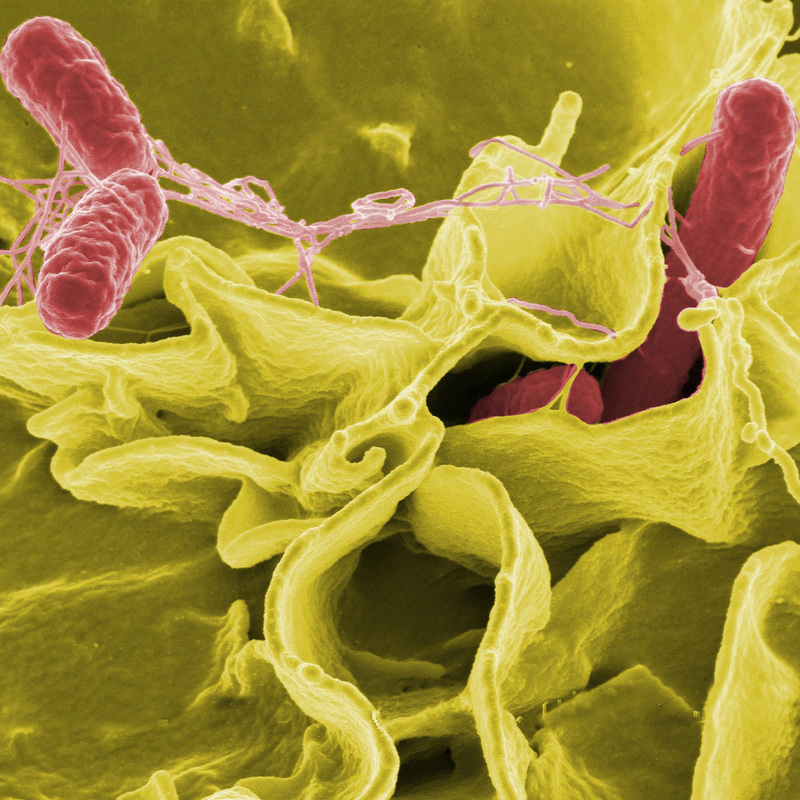 Salmonella causes more hospitalizations and deaths than any other bacterial foodborne illness, and it’s a growing problem, with the number of cases now 44% higher than the late 90’s. The main food sources of Salmonella are poultry and eggs, which cause hundreds of thousands of food poisoning cases each year in the U.S.
Up to 10% of people stricken with Salmonella, E. coli, or Campylobacter are left with irritable bowel syndrome that can last for years or a lifetime. Chronic dyspepsia and Reiter’s Syndrome (a debilitating form of arthritis) can also be the outcome of salmonellosis. Treatment of salmonellosis is becoming complicated because of the increase in drug-resistance bacteria. Common methods of cooking eggs may not be sufficient to kill all Salmonella bacteria. Cross-contamination, either in the kitchen or even in supermarket shopping carts can pose a risk as well. Even though hundreds of thousands of Americans are made ill by contaminated poultry every year, it remains legal to sell meat proven to be contaminated. This is not true in all countries. In Sweden, for example, the number of Salmonella food-poisoning cases is many times lower in the U.S., because it is illegal to sell Salmonella-contaminated poultry there. In 1974 the meat industry sued the federal government and won the right to sell food known to be contaminated with food-poisoning bacteria. Freedom of Information Act documents reveal that the U.S. Department of Agriculture warned the egg industry against claiming eggs are safe, given that more than 100,000 Americans experience Salmonella food poisoning every year from eggs.